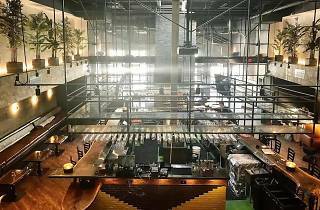 Fans of the popular Miami Beach Korean joint Drunken Dragon and its sister speakeasy Foxhole should plan a trip to Wynwood to check out the group’s newest concept: Rácket. 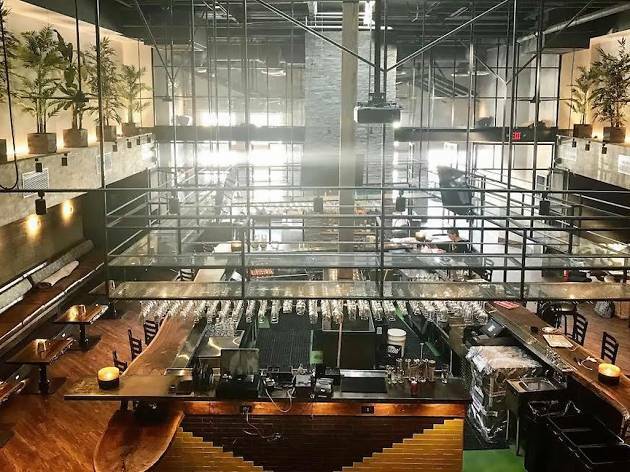 The huge, airy cocktail bar has taken over a warehouse on one of the booziest streets in Wynwood: NW 24th Street, sandwiched between Gramps and J. Wakefield Brewing. Rácket features two adjacent rooms, each slightly different in terms of cocktails and ambiance. The atrium is a bit more laid back. Couches sit in front of bar specializing in tiki-influenced tequila, rum and mescal cocktails. Past the atrium bar, the main room feels more like a lounge for the late-night crowd.